"No chemical or biological weapons will ever be used, and I repeat, will never be used, during the crisis in Syria, no matter what the developments inside Syria," he said on state television. "All of these types of weapons are in storage and under security and the direct supervision of the Syrian armed forces and will never be used unless Syria is exposed to external aggression." Israel is concerned that the chemical weapons will fall into the hands of Hizbullah, and Prime Minister Binyamin Netanyahu declared Sunday his government will “have to act” if Assad’s regime collapses, leaving Hizbullah with the possibility of taking over his military arsenal. 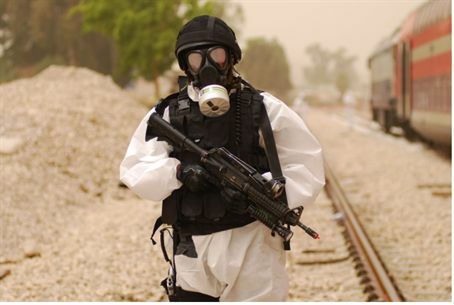 Assad already is suspected of having smuggled some of the chemical weapons into Lebanon for Hizbullah to stockpile. Prime Minister Netanyahu told Fox News Sunday said that “there are other possibilities” than crossing the Syrian border in order to deal with Assad’s chemical weapons. Defense Minister Ehud Barak was ore blunt and stated on Israeli television last Friday, “I’ve ordered the Israeli military to prepare for a situation where we would have to weigh the possibility of carrying out an attack” against Syria’s arsenal, which is believed to include mustard gas and nerve agents that can reach Israel via Scud missiles. Syria never signed the 1993 Chemical Weapons Convention. Despite the Syrian Foreign Ministry’s vow not to use chemical weapons against the opposition, U.S. Senator John McCain does not trust the regime. "These are helicopter gunships, tanks, artillery that are slaughtering people, and now there is a risk -- and I'm not saying it is going to happen -- a risk that in his desperation, Bashar al-Assad might use those chemical weapons," McCain said on CNN. White House Press Secretary Jay Carney told reporters traveling with President Barack Obama on Air Force One, "We believe that Syria's chemical weapons remain under Syrian government control. But given the escalation in violence, and the regime's increasing attacks on its own people, we remain very concerned about these weapons."